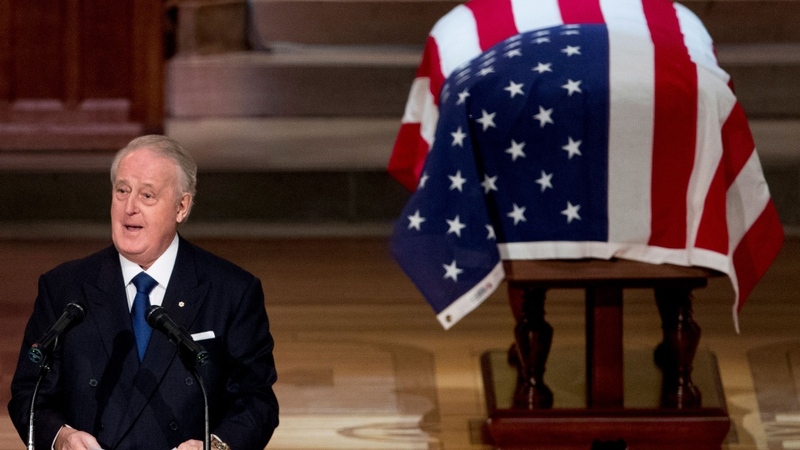 Mulroney eulogized his close friend and confidant during a funeral service at Washington’s National Cathedral on Wednesday. He told CTV’s Power Play that while the loss of the 41st president made him “sad,” he was certain that Bush was happy to be reunited with his late wife, Barbara, who died in April, and their daughter Robin, who died from leukemia in 1953 when she was three years old. He acknowledged that the “relationship of trust” that has traditionally characterized the U.S.-Canada relationship has been “damaged” recently, given the acrimonious renegotiation of NAFTA and President Donald Trump’s levying of tariffs on Canada’s steel and aluminum exports. He cited an instance in the summer of 1990, when he told Bush at his family home in Kennebunkport, Maine, that while Canada agreed with his plans to go to war in the Middle East to expel Iraq from Kuwait, the country would not support the mission unless the United States sought a resolution authorizing the use of force from the United Nations Security Council. “I said, ‘Canada is not a superpower and we work multilaterally and the UN is a major part of that puzzle for us,’” Mulroney recounted. Instead of being offended, Bush agreed and told his administration to seek UN approval. “He took criticism, he took advice and he knew how to act on it and to act on it in Canada’s favour,” Mulroney said. The trick is for Prime Minister Justin Trudeau to use the “interpersonal skills” with which he has been “gifted” in his dealings with Washington, Mulroney said. He also dismissed criticisms of Trudeau for signing the new Canada-United-States-Mexico Agreement without first getting the steel and aluminum tariffs lifted. Mulroney also remembered Bush as a good father and a close friend. In an interview with CTV’s Omar Sachedina on CTV National News, Mulroney said he had many fond memories of fishing with Bush across Canada, and in the Northwest Territories in particular, as well as of nearly four decades of visiting Kennebunkport with his family. During one particular visit, Mulroney recalled watching Bush take his son Mark Mulroney out onto the rocks when the tide had gone out. When Mark came back inside, his father asked him “what the hell did you say to President Bush to get him to take you out there on the rocks” and learned that Mark was curious about how the tides come in and why they go out.